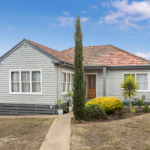 Large family home set on approximately 1100m2 corner block. All the hard work has been done, ready for you to move in and enjoy. With the benefit of copious amounts of Kitchen cupboards, you’ll move with ease whilst you create family feasts in the updated Kitchen. Soak it all up in the tub and set the mood by choosing your own colour theme of LED lighting, cleverly concealed in ceiling, wall niches and under wall hung vanity. Four bedrooms and a study, with option to set up two living areas. Terrific shedding completes this tidy, well thought out package.